How do I Clean and Maintain my Vinyl Deck? So, you’re researching decking options or have just had a new vinyl membrane installed on your deck. These maintenance tips will help you to keep your deck looking new for many years to come. The only regular maintenance of your vinyl deck, other than general cleaning, is an annual inspection. – Check all areas where sealants have been applied to areas where the decking membrane is in junction with the building, posts, columns, vents and drains. Often the areas where this sealant is applied will expand/contract, shrink or shift causing the sealant to crack, thereby breaking the seal. – Check all seams to make sure there are no openings. Although unusual, seams can open allowing water to penetrate the vinyl deck. When discovered early, repairing seams is an easy repair. Contact us to have these repairs done quickly. 1. Always test an unseen area of vinyl before cleaning stain. 2. All cleaning methods should be followed by a thorough rinse of water. 3. Avoid applying cleaners in direct hot sunshine. 4. Certain household cleaners, powdered abrasives, steel wool and industrial cleaners can cause damage and discolouration and are not recommended. 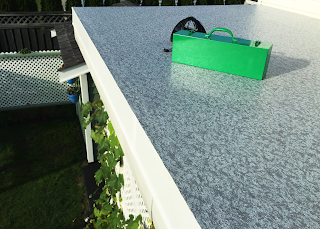 These products will remove the top coat, UV inhibitors and printed pattern, thus damaging the sundeck. 5. Please be aware that some products such as suntan lotion and some permanent marker inks contain dyes that can cause permanent staining. Thanks for reading and remember to call us or send our information along to others for any decking needs. https://vinyldecksbycloak.com/wp-content/uploads/2018/04/5Vinyl-Decks_012917_Cloak0282.png 714 1000 vinyldecks https://vinyldecksbycloak.com/wp-content/uploads/2018/04/Cloak-new-logo-transparent.png vinyldecks2018-04-02 16:23:452018-04-02 16:23:45How do I Clean and Maintain my Vinyl Deck? Save money on your vinyl decking with this installation hack. Quality waterproofing for better price. Looking to save some money on your vinyl deck costs? This tip could get you a cheaper price. Vinyl comes (for the most part) in 6 foot wide pieces. If your deck is, for example, 8 feet wide as many are, the one piece is going to fall 2 feet and a bit short from covering the entire deck. What often happens is that the contractor will order 2 pieces and trim the excess off and use it somewhere else or toss it, in this case that is 4 ft of waste. Depending on the length of your deck this cost of waste can really add up. What you can do is ask you installer to utilize a ‘T-Seam’, as seen in the picture above. Essentially one 6 foot piece is cut straight down the centre to make 2, 3 foot pieces with the ends heat welded together to double the length. This technique can often save you a couple hundred dollars off the price tag and if its combined with the ‘flushed seam’ approach, the final look is very discrete. I hope this information is of use to you and of course please contact Cloak for help with your project. https://vinyldecksbycloak.com/wp-content/uploads/2018/04/Tseam-Example.png 488 640 vinyldecks https://vinyldecksbycloak.com/wp-content/uploads/2018/04/Cloak-new-logo-transparent.png vinyldecks2018-04-02 16:18:102018-04-02 16:18:37Save money on your vinyl decking with this installation hack. Quality waterproofing for better price.